The Concentrator Bubble Humidifier by Salter Labs is a Low Flow 350 cc Bubble Humidifier 6 PSI, designed specifically for oxygen low flow rates up to 6 PSI with face masks or cannulas. Clearly marked, permanent min and max lines help easily identify optimum operation levels. 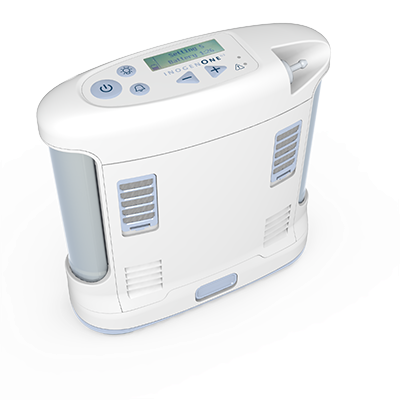 The EasyPulse POC-5 is a lightweight, easy to use, portable oxygen concentrator with 5 continuous flow settings, and an extremely easy to use settings knob. Lightest 5 liter portable oxygen concentrator on the market, only 6 lbs. The Inogen G3 Oxygen Concentrator is a lightweight and portable proving pulse flow oxygen up to 5 liters per minute. Weighing only 4.8 lbs you can easily carry this with you while running errands, in the car or on the plane traveling. Available with a single or double battery for extended use time. The Invacare Perfecto Oxygen Concentrator is an economical addition to the premiere Invacare concentrator line. This 5-liter concentrator is small, quiet and lightweight and comes standard with the Invacare Senso2 Oxygen Sensor. The Oxlife Independence POC is the only continuous mode portable oxygen concentrator that delivers continuous flow rates up to 3LPM while using DC batteries, external DC power, or an AC power supply providing unparalleled flexibility and freedom.